Infinity Stones Assemble! A breakdown of the new 'Avengers: Infinity War' trailer – AiPT! I was hesitant to even do this, but here we are. A new Avengers: Infinity War trailer has arrived, offering a bunch of goodies to longtime Marvel fans who waited (so impatiently) for this trailer. I’ll break down the trailer, highlighting details I think might have been missed. Then I’ll provide my final guesses for where the Soul Stone is and which heroes I think will die. Also, due to some of the things we see, I need to put up a MAJOR SPOILER warning for Thor: Ragnarok. We open with a shot of an ominous fireball coming towards New York City. I’m almost 100% positive that this is the circular ship we see in the original trailer and later on here. Also, I’m thinking this is a scout ship of some sort. Next we see a shot of Black Widow, Bruce Banner, and War Machine (sporting a new armor with tiger stripe decals) looking overhead. We got a glimpse of War Machine in the last trailer, but it’s nice to see him on his feet. This (I believe) makes him the first disabled superhero in the theatrical side of the MCU (Daredevil, on the TV side, would be the first). The first dialogue of the trailer comes from a surprising (but fitting) source – Gamora. As an adopted daughter of Thanos, she will likely play a huge role in the film as she’s the hero that knows him best. The snap, of course, references the iconic opening to Infinity Gauntlet in which Thanos does destroy half the universe. During these opening shots, we see Thanos place the blue Space Stone into the gauntlet next to the already acquired Power Stone. Interestingly, these are the only two stones we ever see in his gauntlet. It’s possible the others have been edited out using CGI, but I wonder if the Avengers will be able to hold him off in this film. We then see Tony Stark say “Tell me his name again,” but he appears to be in a different location as Gamora is in a starship (probably the Milano) and Tony appears to be in a house. My guess is that Gamora is talking to the Guardians and/or Thor, while Tony is talking to Bruce after his crash into the Sanctum Sanctorum. Next we get a shot of Thanos in his full armor with the Gauntlet. 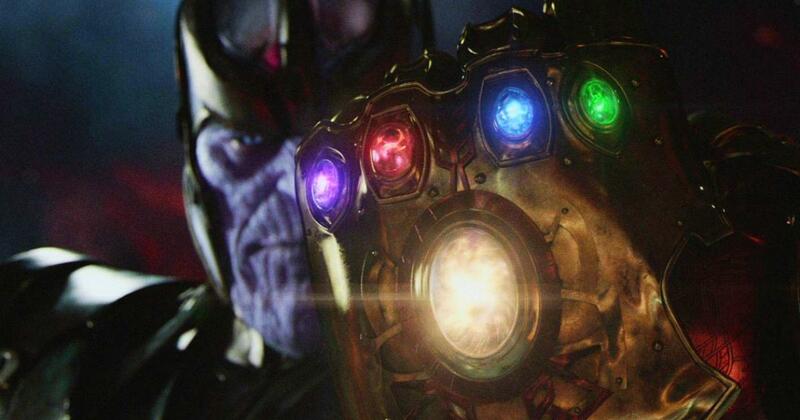 If you look closely, you can see the Power Stone is already in the Mad Titan’s possession. My guess is that this is Thanos boarding the ship Thor and his kingdom left in at the end of Thor: Ragnarok. Next we see Peter abandon his school bus and don his traditional Spider-Man suit after the arrival of the odd ring ship. In one of the cooler shots of the trailer, we see Iron Man’s new modular armor convert into a single rocket to shoot after the ring ship as it flies away. Based on a shot of Peter in the Super Bowl TV spot, I’m thinking this is Tony saving the young hero from being sucked into the vacuum of space. In these shots of Vision (Mind Stone still attached) and Wanda, you can see that they’re in the jungle, suggesting this is Wakanda, and that the reason for the forces of Thanos to attack there is to get at Vision. A lot of fans have been theorizing that Wakanda has the Soul Stone, but I think that’s fairly unlikely. That would mean that three of the six Infinity Stones were “accessible” on Earth, as the Space Stone (the Tesseract) was sitting in Norway before HYDRA picked it up, while the Time Stone was in Kamar-Taj. For six cosmic items of universal value, that seems a bit unrealistic. Also, while most fan-theory talk has focused on the Soul Stone (I’ll offer up my own theory a little further down), I think it’s important to note that the Reality Stone has also gone unaccounted for in both trailers. It was last seen in the possession of the Collector in the post-credits of Thor: The Dark World, but it’s possible that he’s either sold it or it’s been stolen from him in the time since we last saw it. Black Widow and Steve Rogers approach King T’Challa, flanked on his right by his General Okoye, and on his left is Ayo, played by Florence Kasumba. While the focus on these shots is the handshake between Cap and T’Challa, I find it humorous that Black Widow is avoiding eye contact with Ayo who is staring her down. Ayo famously told Black Widow, “Move. Or you will be moved” in Captain America: Civil War and it’s nice to see the Russo brothers subtly continue that interaction here. Shuri!!! She is projecting an image of Vision through her kimoyo beads as Vision lies on the table in front of her. Blink and you miss it, but you can just see Bruce Banner’s glasses enter the left of frame before the trailer cuts to the next shot. It should be a lot of fun seeing Shuri working with Bruce Banner to try to help Vision. Next we see Star-Lord, Gamora, Drax, and Mantis exit a ship into a seemingly abandoned facility. Groot and Rocket are notably missing. Where are they landing, exactly? It’s unclear, but that small ship to the left seems to bear an uncanny resemblance to the mining ships in Knowhere, home of the Collector (Benicio del Toro) who was the last known holder of the Reality Stone. In Guardians of the Galaxy, Knowhere was a bustling spaceport. If that is where the Guardians have landed, something terrible seems to have happened. Star-Lord, Iron Man, Spider-Man, and Drax argue about their strategy to fight Thanos. This orange planet, which I had thought to be Xandar in my earlier trailer breakdown, is actually Thanos’ homeworld, Titan. Doctor Strange, who is shown in the Battle on Titan, is notably absent from these shots. Could even more heroes have made the journey into space? The next few shots show the Avengers in Wakanda heading out of the city to face the towering pods of the Outriders, the bulk of Thanos’ army. Cap and Black Panther ride in one pod, while Black Widow and Bucky ride in another. It will be interesting to see just what Bucky’s relationship is with Wakanda, as he’s been bestowed a new metal arm. Ah, the Hulkbuster. I’m 99% sure that is Bruce Banner in the armor, as it seems that Banner might be having some difficulty turning back into Hulk. Next we see Thor, Rocket, and Groot – a trio that seems to be off on their own journey in the film. The merchandising for the film has given away part of what that journey is about, but I won’t spoil it here. During this section, we also hear some additional dialogue that sounds like it’s Thanos, but I’m not sure that all of it is. “When I’m done, half of humanity will still exist,” is almost certainly Thanos. But that “The end is near” that precedes it sounds a bit different in cadence and inflection. I’m thinking that’s a member of the Black Order, though I can’t say for sure which one. The ring ship comes crashing in on Titan. I’m thinking that this is when our Space Avengers duke it out with Thanos, but this could be from a separate event. In a promising sequence of shots, we see a flashback to Thanos’ arrival on Gamora’s homeworld. In this first shot, I thought Thanos was holding some sort of red mace, but after looking at it more, I think it’s simply young Gamora’s red hair. These appear to be Chitauri warriors holding Gamora’s people at bay. It’s interesting that Gamora would be so readily isolated from her people. What makes her so special? Either way, it seems like we’ll get a look at the intimate and often cruel relationship between “father” and “daughter” here. What follows is a sequence that I think will play out near the beginning of the film. Thanos has Thor on his knees, his head ready to be smashed like a grape. Of note, Thanos is in his full armor in these shots, calling back to the first shot of him in this trailer. Next we get a shot of Loki and the entire Black Order. Left to right is Proxima Midnight, Ebony Maw, Corvus Glaive, and Cull Obsidian (Black Dwarf in the comics). In my last breakdown, I noticed that Loki was crying as he seemingly handed the Tesseract (containing the Space Stone) to Thanos, and now I think we can deduce why. I think Thanos is going to hold Thor hostage and demand Loki give up the Tesseract in order to spare Thor’s life. Either way, it’s only a moment later before we see Thanos (notably without either his armor or the gauntlet) crush the Tesseract to access the Infinity Stone inside. Next we flash to the Battle of Wakanda, where a horde of Outriders attempt to break into the city’s shields. The explosions are happening on the Avengers’ side of the shield while the Outriders appear to be stuck outside, so I’m not entirely sure what’s happening in the scene. Doctor Strange is seen using his powers to create platforms for Star-Lord to jump to. The purple blasts being fired bear a strong resemblance to the energy the Power Stone gave off in Guardians of the Galaxy and you have to think that even one of these blasts could be lethal to any of the heroes. Ebony Maw has Doctor Strange in his clutches. In the comics, Ebony Maw proved to be one of the most powerful of the Black Order, possessing Doctor Strange with relative ease. Maw also had his own agenda, independent of Thanos. We see that Doctor Strange has the Eye of Agomotto around his neck here, yet we never see Thanos with the Time Stone. Is it possible that Ebony Maw has taken it for himself? More of the Battle of Wakanda. We also get to see the long-range firing power of the Wakandan spears — something that was mentioned in Black Panther but never shown. Here we get a nasty look at the Outriders swarming the Hulkbuster and taking it down. Just who will they find inside? “I hope they remember you,” Thanos says before launching into a massive superman punch. Thanos’ dialogue in this trailer really shows a bit of his character as he is looking to restore balance to the universe rather than causing complete destruction. Cap vs. Thanos. This should be an easy win for Thanos, even without the Infinity Stones. We see he has both the Power Stone and Space Stone (as stated before, it’s possible he has more but it’s been edited out for the trailers). So just how is Captain America matching Thanos here? If you haven’t guessed by now, my theory is that Steve Rogers is in possession of (or being protected by) the Soul Stone. The Infinity Stones cannot be destroyed by conventional means, and Steve is arguably the most pure of heart of all the other heroes. Besides, are we really expecting the creative team behind Captain America: The Winter Soldier and Civil War to not give Cap an Infinity Stone? Granted, it could just be Cap giving one final grasp of Old Man Strength, but Thanos’ face seems utterly perplexed, ruling out the idea that Thanos is merely toying with Cap. The final shot of the trailer is a doozy, with Spider-Man avoiding fireballs hailing down on Titan. For a second trailer, I think this did a fantastic job at showing new action bits without spoiling too much of the story. I think Marvel’s done a good job recently at keeping action beats hidden from the advertising, versus the campaign for Avengers: Age of Ultron where I felt I saw half the film before it came out. Loki: Regardless of the circumstances in which Loki hands the Tesseract over to Thanos, I don’t think the Mad Titan will forgive him for delivering this prize so late. Loki was, after all, expected to retrieve the Tesseract for Thanos in the first Avengers. Star-Lord: Go ahead and call me an idiot in the comments section below, but hear me out first. Let’s face it, fans are expecting Steve and/or Tony to bite it. In fact, I think there will be people disappointed if both Iron Man and Captain America make it out of the film alive. Hulk doesn’t have a franchise and the Thor’s trilogy is over with, so they wouldn’t pack as much of a surprise. But killing Star-Lord when fans know there’s a Guardians of the Galaxy Vol. 3 on the way? That’s ballsy. If the first Guardians film dealt with the formation of a family and the second mulled over that family growing and dealing with its own issues, why couldn’t the third cover how a family endures after the head of the family has passed? Vision: This one seems like a no-brainer. If Thanos is coming for the Infinity Stones, then one needs to come off of Vision’s head. It’s possible that he won’t actually need the Mind Stone to stay alive, but at the same time, I can’t see Vision just letting Thanos pull it off. He’s going to fight, and I think he’s going to lose. Captain America: I went back and forth on whether it would be Cap or Tony that doesn’t make it. At one point, I even thought that both of them would die. But now, I’m leaning towards Captain America getting crushed by Thanos near the end of the film. So, I’m predicting four major deaths in the film. What do you think?